ASTRI POLSKA SOFTWARE IMPLEMENTED IN ESA. IT’S ALREADY RUNNING THE FIRST TESTS OF SPACE GNSS RECEIVERS. Astri Polska has finalized a test environment for the space-grade GNSS receivers developed within the ESA’s FLIGhT project. On 7th of February, the final review was approved and the FLIGhT software officially started working as a standard ESA tool in the ESTEC European Navigation Laboratory (ENL) in Noordvijk, the Netherlands. The general goal of the FLIGhT project (FLexible envIronment for GNSS Testing) is to design and develop an adaptive and flexible software application that will integrate a variety of apparatus to create a complex test environment for GNSS receivers, with a focus on space-grade devices. “Thanks to our solutions, ESA will receive a unique tool that will allow it to perform independent tests of advanced space-grade GNSS receivers. Previously, ESA had to rely on tests provided by receiver manufacturers,” said Karol Brzostowski, Head of Astri Polska Space Applications and Services Division. The software will constitute the core of the testing system. Its general architecture is divided into several functional blocks, which provides the end user with a remarkable versatility of application. 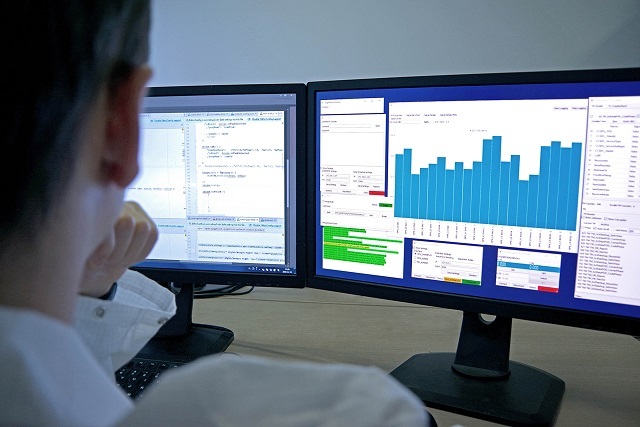 The main part of the software can be used to operate all the measuring equipment integrated by the software, communicate with the device being tested, run test scripts, and generate test reports. It can perform a number of predefined analyses, including the Position Velocity and Time (PVT) and Time-To-First-Fix (TTFF) analyses. There is also a rich graphical user interface (GUI) that enable the user to operate external devices (e.g. the power supply and a GNSS emulator), to operate and send commands to the GNSS receiver being tested and to present some of the test results in real time. “When designing the software, we made a special point of ensuring that it would be as flexible and adaptive as possible, so that it could be used, after minor adaptations, to test many different GNSS receivers. In order to achieve that goal, we’ve developed a system architecture that allows the software to be used with new receivers and equipment,“ stressed Brzostowski. Currently, ESA team in cooperation with one of Astri Polska engineers, seconded to ESTEC for a 6-month period, is using the FLIGhT software for characterization of PODRIX GNSS space-grade receiver in the frame of RETE (Space Receiver Testing and Characterization) contract. Astri Polska is the only Polish company with experience in the testing of space-grade GNSS receivers. One of its previous projects involved tests of the LION space-grade GNSS receiver. Currently, the company is working on the GNSS radiation tests, hybrid navigation (GNSS+LTE), GNSS antennas calibration, and development of dedicated GNSS test environments. Apart from GNSS, the company specializes in EGSE, OGSE, and Space Applications & Services. Astri Polska is a joint venture of Airbus Defence and Space, and the Space Research Centre of the Polish Academy of Sciences.